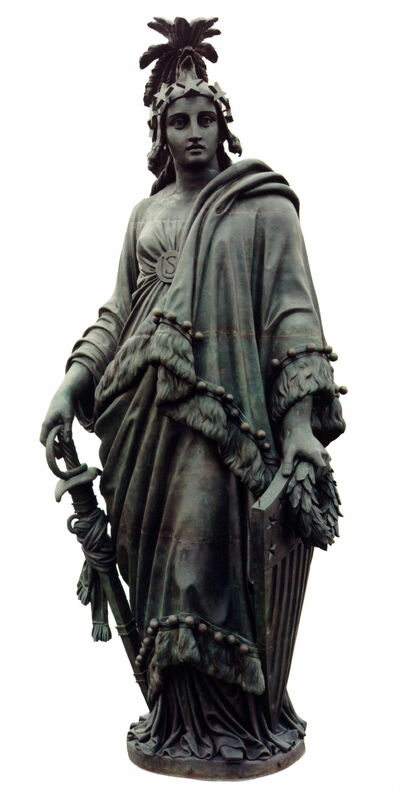 How on Earth did a statue about freedom end up having nothing symbolizing freedom on it? In 1855, the United States commissioned architect Thomas U. Walter to redesign the U.S. Capitol Building to accommodate the growing number of representatives from added states. Both the east and west wings were extended and the former mint-green copper dome was next on the chopping block. In his redesign, Walter imagined the rotunda as it is today with a sixteen-foot statue adorned with Roman symbols of freedom standing on top. Construction Superintendent and mustache enthusiast Captain Montgomery Meigs requested Thomas Crawford to create their statue. Having already worked on other artistic features found on the building, Crawford accepted Meigs commission and began work in his studio in Rome. Crawford completed three maquettes (small concept models) which he photographed and presented to Meigs. Prominent in each concept was the addition of a liberty cap - a traditional Roman symbol of freed slaves - and a sword/shield to depict armed freedom. It was the inclusion of the liberty cap which former Secretary of War and slavery apologist Jefferson Davis voiced concerns with. Davis, who in five years would inhabit the highest office of team wrong-side-of-history during the Civil War, attempted to stifle the growing abolitionist attitude within the north by using his office to remove references to slavery on public buildings. Following on the heels of both the Fugitive Slave Act (1850) and Uncle Tom’s Cabin (1851), Crawford’s statue represented yet another battleground in Davis’ war on public perception. As a result, Davis demanded Crawford make numerous changes to the proposed aesthetic of the statue and hoped everyone would just kind of forget about the whole ‘four million slaves residing in the United States’ thing. Chief among these changes was the removal of the liberty cap which Davis considered inappropriate as he viewed American freedom as original and not that of a freed slave. Crawford - who must have rolled his eyes hard enough to see his brain - resisted the proposed changes initially but Davis insisted his vision of the statue be fulfilled. As Davis was both impervious to semantics and had the final say on the project, Crawford yielded to the demands and removed all references to slavery and freedom from the final draft. Instead, the approved design opted for a confusing combination of the most horrified eagle in history below a feathered helmet, a Native American-inspired robe, and the common sword/shield combo. Despite the loss of artistic freedom, Crawford’s work progressed and the full sized clay statue was completed and cast into five large plaster sections in 1857. Unfortunately, due to previous medical issues combined with the devastating irony of delivering a statue of freedom to a slave owner, Thomas Crawford died suddenly before the work left his studio. Two years and several leaky boats later, the plaster model arrived in Washington D.C. in March of 1859. In order to cast the statue into bronze, Jefferson Davis hired self-taught sculptor Clark Mills who established a temporary foundry south of the White House. Work began in 1860 but halted almost immediately as no one knew how the five sections of the plaster model came apart. Even worse, the Italian sculptor Mills hired to disassemble the plaster model refused to work until he was given a pay raise. Without the cooperation from the Italian sculptor or a readily available ouija board to contact Crawford, the project seemed doomed. Fortunately for Mills, Philip Reed would not give up so easily. Philip Reed (formerly Reid) was an African American slave owned by Mills who had demonstrated a certain knack for problem-solving. Using a pulley and tackle system he designed, Reed and Mills were able to successfully pull apart the plaster model into its five component sections. 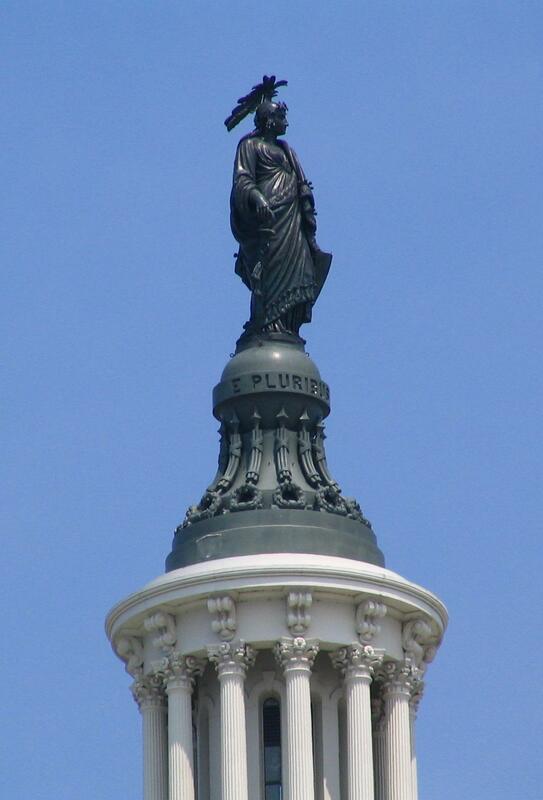 Thought the casting was temporarily delayed by the beginning of the Civil War, the Statue of Freedom would be mounted on the rotunda in 1863 observed by Reed who was freed one year prior by the Emancipation Proclamation. In the last recorded writing concerning Reed in 1865, author S.D. Wyeth described him as, “...in business for himself, and highly esteemed by all who know him." So much for semantics, Davis.